Cracked skin results from tiny splits that occur in dry, damaged skin. If left untreated, these tears can grow into deeper cracks; also known as fissures. A common area for cracks to appear is the heel as it carries the weight of the body whenever you stand. This could be because of dry skin that has built up. Without regular removal of dry skin and a lack of moisture, cracked heels could appear more often. In the initial stage of the condition, the heel starts to feel tight when placed under any kind of strain. Intense dryness, itching and tenderness of the skin are often the first signals of the problem. The affected area can turn yellow or brown in color and tends to harden significantly. In its more advanced stage, the heel may become so dry that it turns white, yellowish or red in color and begins to flake. Cracks can deepen to the extent that the simple act of walking becomes incredibly difficult. If left untreated, cracked heels may start to bleed and become infected with bacteria. An effective way to prevent the formation of cracked skin is through the use of a moisturizer. Amopé Pedi Perfect™ Daily Moisturizer can help hydrate and soften cracked heels by improving the skin’s elasticity. Apply the cream twice a day to clean, towel-dried skin by massaging it into feet until it’s completely absorbed. 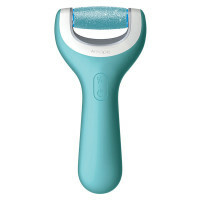 Another essential tool in the fight against hard skin is a foot file, such as the Amopé Pedi Perfect™ Electronic Foot File with Diamond Crystals, which can buff away hard skin by removing it until smoother, softer skin is revealed. When it comes to cracked skin, taking care of your feet regularly is always better than letting your cracked skin get worse. It’s important that you give your feet the same care and attention that you’d give the rest of your body. If you’re always pressed for time, soften hard skin quickly by soaking your feet in warm water. Remember to wear shoes that protect and support the pad of the foot and avoid shoes that are too loose or tight.